Dr. Ad van der Spekis a senior marine geologist specialising in long-term coastal evolution and morphodynamics. He wrote a PhD thesis on large-scale evolution of Holocene tidal basins in The Netherlands. He has been working with Deltares and the Geological Survey of The Netherlands for over 25 years and participated in both national and international research projects. The latter include the Dutch-Indonesian Snellius II marine science expedition, several EU-funded projects on the impact of climate change on coastal areas, and the Coastplan project, which addressed the relevance of geoscience for Integrated Coastal Zone Management in East and Southeast Asia. The latter project included the organisation of workshops and seminars. Ad van der Spek was the course leader for an Offshore Mapping Course that was organised in May 2002 in The Netherlands for the Research Centre for Coastal Geology, China Geological Survey. He is Technical Adviser to the Qingdao Institute of Marine Geology, Qingdao, P.R. China. 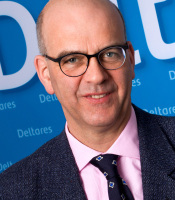 He represents Deltares in the Netherlands Centre for Coastal Research NCK and works as Associate Professor at the Coastal Engineering Section of Delft University of Technology (Faculty of Civil Engineering and Geosciences;) and at the Coast Engineering and Port Development Group at UNESCO-IHE. He received the yearly publication award of TNO-National Geological Survey in 2000 and 2007. Since 2006, he is involved in research for support of the national coastal nourishment policy, as programme manager and advisor and as scientist. His research interests include long-term coastal morphodynamics, reconstruction of coastal evolution, dynamics of beach barriers and tidal basins, long-term sediment budgets, sea-bed dynamics, biogeomorphology and large-scale sedimentary coastal maintenance strategies.